No bailout money was used in the production of this automobile. 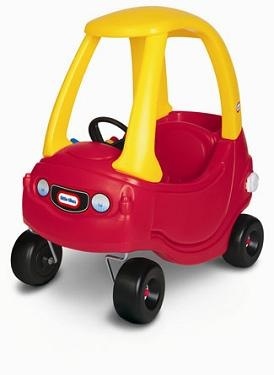 Yes, it?s the Little Tikes Cozy Coupe, a venerable model introduced in 1979 ? earning itself a permanent spot recently at the Crawford Auto-Aviation Museum in Cleveland. With an MSRP of around $60, the pedal-powered single-seater sold more than 457,000 units last year ? more than any model of the gasoline-powered variety. It?s American-made in Hudson, Ohio, and free of the taint of bailout money or White House-engineered bankruptcy proceedings that hosed secured creditors.